Directors Don Argott and Demian Fenton offer a candid look at this madly talented artist, whose unexpected journey made him a prodigious diamond in the music business rough. For decades Liebling churned out genre-defining hard rock as the lead singer of the doom metal band Pentagram. But various acts of self-destruction, multiple band breakups and botched record deals condemned his music to obscurity. 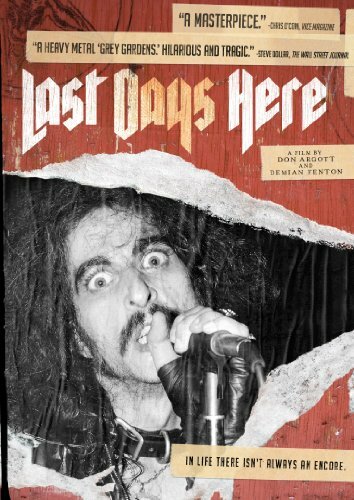 Chronicling the triumphs and downfalls of cult rock legend Bobby Liebling, Last Days Here is a powerful documentary about an underground icon who finds himself at the crossroads of life and death. For decades Liebling churned out genre-defining hard rock as the lead singer of the doom metal band Pentagram. But various acts of self-destruction, multiple band breakups and botched record deals condemned his music to obscurity. Creatively frozen for years and living in his parents' basement, Bobby is finally discovered by the heavy metal underground, and with the help of Sean 'Pellet' Pelletier, his friend and manager, he struggles to overcome his demons. Directors Don Argott and Demian Fenton (The Art Of The Steal, Rock School) offer a candid look at this madly talented artist, whose unexpected journey made him a prodigious diamond in the music business rough. It's a moving real-life drama that, like New York Doll, the story of Arthur 'Killer' Kane, reveals the power of music and the artistic impulse to redeem lives that had been seemingly lost. The directors filmed hundreds of hours of footage over three years with very little budgeting. Fenton said about addressing the swift changes in Liebling's life, "Many times we had to finesse the rapid shifts in Bobby's life so the viewer wouldn't be left confused." He said that Liebling had shown multiple sides of himself, which the directors tried to balance for their documentary. The Los Angeles Times' Gary Goldstein called this IFC Films theatrical release "a deft and weirdly affecting portrait of how a drug-addicted man-child knocking on death's door manages an astonishing resurgence."